After putting an invisible zipper into this dress, I checked the bottom end to see if there was no bubble. It's obvious that the two sides are not matched up, but I really don't want to rip and redo this zipper. So, I think pressing it will take care of the problem. 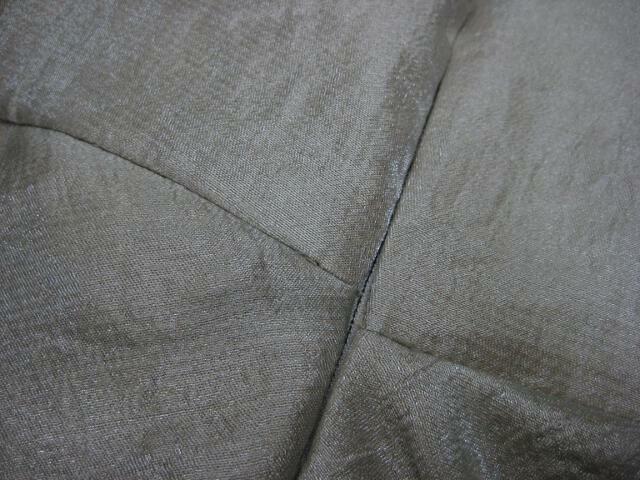 Unfortunately, I cannot ignore the fact that the horizontal seams are also mismatched here.. Sometimes when we sew, we are torn between wanting a garment to be perfect, and wanting a garment to be done! In the end, we have to be satisfied with ourselves and our work. I am not a perfectionist, but I do strive for excellence. Needless to say, I ripped out the second side of this zipper and put it in the right way. You can read more about it here at my website. Oh, No. My Dress Shirt has Wings! Have you ever had a shirt that looks like this when you button it? The darn collar just won't stay in place. You look like an airplane has just landed in your throat. Adding collar stays is not my favorite solution because there is no slot for them on the under side of the collar. 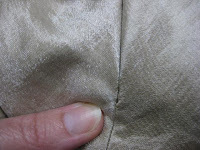 If you make a "pocket" for a stay, either the stitching will show on the collar's right side, or you have to use hand stitching which may not hold. 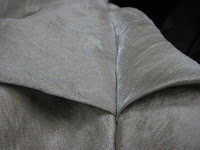 I chose to add a buttonhole to the corner of the collar, as shown here. I then had to mark the spot where the button will go. This is not as easy as it looks. 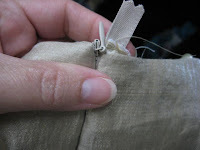 Make sure you leave a gap where the tie threads through. Mark the spot with a pin, while the person is wearing the shirt (see previous photo). When you attach your button, use a piece of scrap fabric or felt on the inside of the shirt. This will keep the button from pulling through the shirt and creating a hole. Have the person try on the shirt and put on a tie. Don't feel bad if you have to move the button. Placement here is trial and error. Unless, of course, you have a more accurate method. Then, by all means, leave it in the comments below.